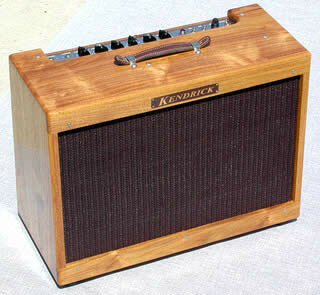 The Jazz Amp is a 100% tube guitar combo amplifier, which features point-to-point handwired circuitry. A massive interleaved paper-bobbin output transformer provides headroom and touch sensitivity that has been previously missing in other Jazz Amp designs. Brazilian Canarywood cabinet resonates with only the fundamental notes being played. The result is a focused tone not unlike a long scale grand piano. The 10" ceramic speakers provide the bottom-end normally associated with larger speakers however the lightweight cones of a 10" design are fast and spanky. The high-end is silky, smooth, yet extremely round. This Jazz Amplifier is recommended for the jazz player that thought he had it all.